Holly Martin is the editor of High Plains Journal/Midwest Ag Journal. KISSIMMEE, FL, February 28, 2013 — The BASF Crop Protection business will team with the American Soybean Association (ASA), the National Corn Growers Association (NCGA) and the National Wheat Foundation (NWF) to present 10 students with scholarships during the 2013 Commodity Classic in Kissimmee, Florida. The scholarships will be awarded to students across the country pursuing degrees in agriculture. 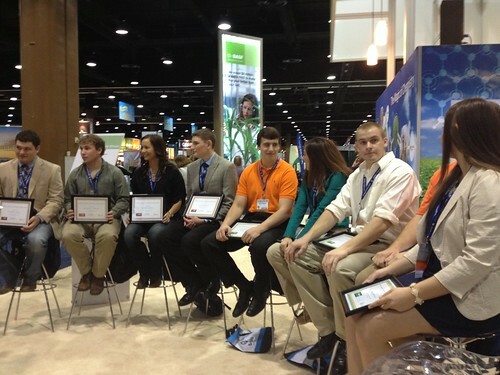 Recipients will received their scholarships from Rea during the Commodity Classic in the trade show booth. The 2013-2014 ASA Secure Optimal Yield (SOY) Scholarship is a $5,000 award presented to an outstanding high school senior who has achieved high academic and leadership requirements, and is planning to pursue a degree in an agriculture-related field at an accredited college or university. Mason Kiehl of Meadville, Missouri, was chosen as the 2013-2014 ASA SOY scholarship recipient. Kiehl, a senior at Meadville R-IV High School, will pursue a degree in agricultural systems management at the University of Missouri in Columbia, Missouri, beginning this fall. The scholarship is offered and managed by the ASA and is made possible through a grant from BASF. For the sixth year in a row, BASF will team with NCGA to provide scholarships to undergraduate or graduate students pursuing an agricultural degree. This year, the scholarship has been renamed the William C. Berg Academic Excellence in Agriculture Scholarship Program, in memory of Ohio corn grower and NCGA colleague Bill Berg, a long-time member of the NCGA Grower Services Action Team and supporter of the scholarship program who passed away unexpectedly last year. “Anyone who ever met Bill knew he had a passion for agriculture; this seemed like a fitting way to honor his memory and support the future of the industry he loved so much,” said Pam Johnson, President of NCGA. Emily Brundick of Argyle, Missouri – a first year graduate student at the University of Missouri, studying agriculture economics. Kyle Parmley of Perry, Oklahoma – a junior at Oklahoma State University, studying plant and soil sciences. Nicholas Peterson of Clearlake, Minnesota – a junior at the University of Minnesota, studying applied plant science. Sterling Schnepf of Granville, Iowa – a junior at Iowa State University, studying animal science. Brent Sexton of Rockwell City, Iowa – a junior at Iowa State University, studying animal science. This year BASF and the NWF established a new scholarship fund to honor longtime wheat industry friend and BASF employee Jerry Minore by supporting students pursuing careers in agriculture. As a BASF Senior Market Manager, Minore was a liaison to the wheat industry, including the National Association of Wheat Growers (NAWG) and the Foundation, and an advocate for wheat growers who passed away unexpectedly in February 2012. To honor his advocacy for the wheat industry, BASF partnered with NAWG to fund $1,000 and $1,500 Jerry Minore Memorial Scholarships that will be awarded to four students each during the next three years. John Rosman of Creston, Washington – upcoming freshman at Oklahoma State University, studying agricultural communications. Morgan Perez of Lind, Washington – a junior at Washington State University, studying agriculture technology and production management. Joshua C. Duling of Mupin, Oregon – a junior at Eastern Oregon University, studying agriculture science. Garrett Reiss of El Dorado, Kansas – a sophomore at Butler Community College, studying agronomy. For more information about the industry initiatives BASF supports or the BASF Crop Protection portfolio of products, visit http://agproducts.basf.us/, like us on Facebook and follow us on Twitter.